On Saturday, December 10th, Gibson Southern Theatre Department’s I.T.S. 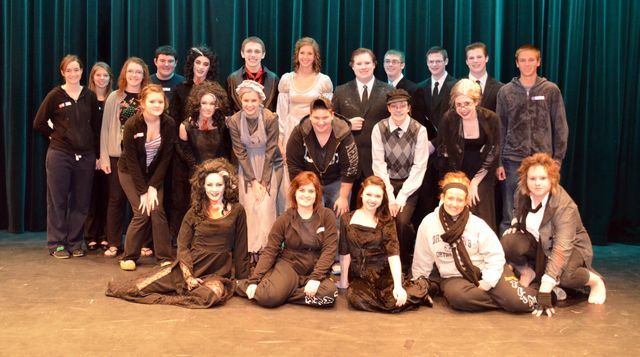 Troupe # 5623 performed its’ cutting of Dracula by John Mattera at I.T.S. Regional competition held at Brown County High School. At regional competition, the piece performed by each troupe including the time used to set-up and strike, or take down, the set must encompass less than 45 minutes. 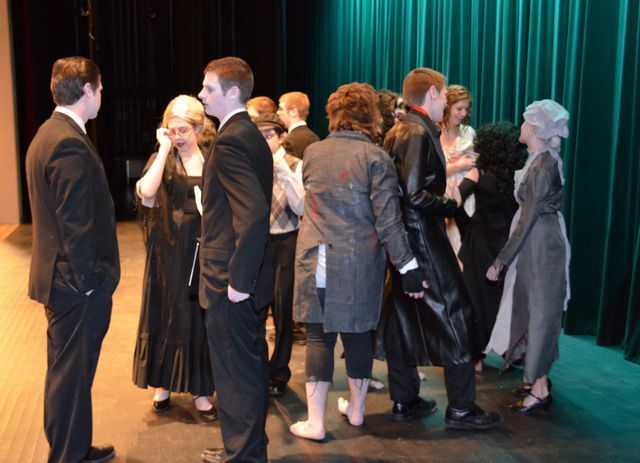 Fourteen very talented students were included in the cast, and the production team included Matt Hart, the Director and Thespian Sponsor, and nine students. The preparation for this performance began months ago, when Matt Hart chose this play to be performed and decided to use a full black and white color treatment with just a pop of color in the play. Cast members began rehearsing in November, and crews worked hard all last week to prepare themselves for the competition. The students involved departed Gibson Southern at six o’clock in the morning on Saturday to make the almost three-hour trip to Brown County. Upon arrival, cast members got into costume and applied their extensive make-up. Meanwhile, the stage manager as well as sound and light crews scoped out the stage on which the cast would perform and the backstage area. As this was happening, the stage and load crew, as well as a few very helpful, dedicated parents, unloaded the U-Haul, which was rented by the department to transport set pieces and props, and placed these items right outside a door that cast and crew members would later move the items through before the timer began. The return trip ended up taking nearly three and a half hours, including a brief stop for lunch. When the students arrived back at Gibson Southern at around 2:30 P.M., they immediately unloaded the set pieces and props and left very soon after due to the fact that many of the students were planning on attending the annual Sweetheart dance that night. Students were notified by Director Matt Hart around four o’clock that they had received excellent ratings and had received the Technical Award. Natalie Bengert also was honored by being named “Student Officer Favorite.” However, the troupe did not advance to State.